Shake Islands is an arcade simulator with elements of strategy. In this game you will get awards and collections allowing construction of original transport for travelling to the next island. Tanned and generous local visiting your bar, unique cocktails with original recipes, your own garden where you can grow fruit – all is subordinated to the main idea of transport construction. The way to your own ship is long and difficult. 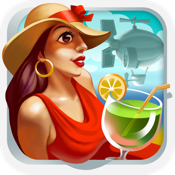 Many cocktails will be made and many collections and treasures will be gathered before you explore all the islands.